Drain your fuel. If you’re lawn equipment is gas powered, you’ll want to drain your fuel. Once you’re on your last tank of fuel, add a fuel stabilizer to protect your equipment. Run your engine for 5 minutes to ensure the stabilizer has a good chance to distribute throughout the system. Turn your equipment off and let it cool. Drain your excess fuel from your equipment, disposing of it appropriately. Unused gas that’s left in your equipment during the winter months can become stale and gum up the carburetor encouraging rust. Don’t save the fuel you drained for the spring, you want to make sure you’re using fresh fuel. Start your engine and run your equipment until you’re out of fuel. Prime / choke and attempt to restart. Repeat this until all your fuel is used. Remove your battery. If your equipment is battery powered and you are able to remove your battery, remove it, wipe it down and store it in a strong carboard box, off the ground, in a warm dry place. Clean your equipment. Once you’ve drained the fuel (if it’s gas powered) from your equipment and it’s not running, you want to make sure you clean it thoroughly before storing it for the winter. Leaving excess leaves or grass on your equipment is an invitation for rust. Tune-Up? If you haven’t done any seasonal maintenance to your equipment yet this year, it might be a good opportunity for a tune-up. Think about changing, or washing your filters, changing your oil, sharpening your mower blade, replacing your trimmer head, check the tread on your wheels, and replacing your spark plug (even if your spark plug is in good shape, it can help encourage a good start come the spring). Bust out your owners manual. Read your owner’s manual and preform suggested maintenance for storage. Can’t find your owner’s manual? Most manufacturers will have a digital version online. Store it. When you’re picking a place to store your equipment, make sure you pick a cool, dry, place such as your garage or garden shed. Try and avoid leaving your equipment outside all winter or storing it next to a furnace, water heater or appliance with a pilot light. Need help with your equipment maintenance? 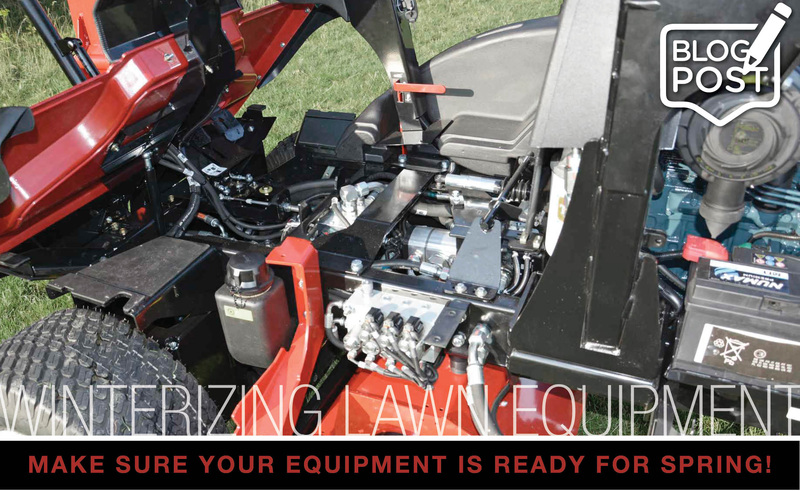 Let one of our professionals give your lawn equipment a full tune-up and we’ll help winterize it for the colder months to ensure it’s running optimally in the spring. Check out our blogs Keep Your Mower Running Smoothly and Prepping Your Yard For Winter.